@f.sjl: How can we effectively package immigration to the American public. For better or worse, some people believe immigration has hurt them economically. The numbers don't bear that out but how do we go about communicating that? Communicating this is tough. We need to acknowledge people are struggling. But the solution isn't to take it out on immigrants. Rather we need to level the playing field. @felicia: How is the rhetoric of someone like Trump going to affect the GOP coalescing around some sort of immigration proposals, even with red meat like border security included? Strangely, I think Trump is good for the good guys in the GOP. Trump wants to deport 11m people. Either you are for that or you are for a smart solution. 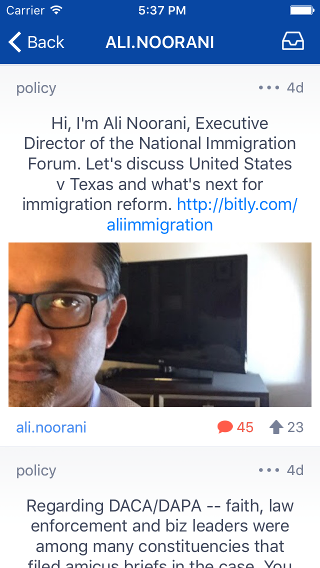 @pay.cooper: Hi Ali, what's the most important piece of immigration legislation in Congress today (good or bad) and why? The Gallegos bill on immigrant veterans is important. The McSally border bill is solid as well. @bayard.cheney: Thanks for doing this, Ali. What are your thoughts on the guest worker programs? Are you more with Bernie or with Hillary there? Yes(?) I think guest worker programs need to meet the needs of our workforce and our families. The Chamber and Labor worked out a great compromise in S744 in 2013. @elchapo: Under what conditions do you think comprehensive reform could actually pass within the next five years? I think the conditions are ripening. In this line of biz, choices are good. And the choice is between mass deportation and legalization of the undoc. @f.sjl: Do you think we need to include stronger enforcement of current immigration laws as a part of immigration reform? We are spending hundreds of billions of dollars on enforcement. (http://www.americanactionforum.org/research/the-budgetary-and-economic-costs-of-addressing-unauthorized-immigration-alt/) I don't think we need more enforcement. @simple.joe: People promote the term "this country was built by immigrants" so then do they resist it so much? Is the bigger issue here about "self security”? Great question simple.joe. I think this is an issue about culture and values before it is policy and politics. So we need to help people understand culture change is good b/c immigrants believe in American values. @international.u: Is the chatter about H1B abuse based in reality? There are def some bad actors and we need to fix the program. But ending the program would undermine our economy. @javits.javits: Adding it international.u's question, I've found the the H1B process heavily favors large corporations since the process is so costly and time consuming. How can H1B be reformed to work for startups and small businesses? And should it work for them? There is new legislation looking at visas for startup entrepreneurs. Really smart idea that was in S744. @javits.javits: Another concern I have over H1B is that in my experience H1B holders often feel trapped in their jobs because the requirements are so onerous -- can't just quit without risking deportation, only employers who will foot the legal bill will take you, and the time constraints. Is it fair to them? Guest worker visas need to have portability protections. It can be done in a way to protect employer and employee. @spendingtaxpayercash: How does DAPA NOT violate the Take Care Clause of the Constitution? The administration is taking care to prioritize law enforcement resources and execute the letter of the law by focusing on those who are here to do harm. They are merely deferring action on those they see as posing no risk. @dexter.fenner: Sarcasm is all we know here. Good to know re sarcasm. Big relief. @andy.harris: What are your thoughts on the implication United States v Texas could have on the separation of powers between the executive and legislative branches, federalism? If the court rules against the administration any state can sue the Feds for practically anything that might cost the state money. Congress is losing the opportunity to actually hold the reins. @javits.javits: Re: startups: There's no visa for small business owners. The investor visa program has a high threshold. It all adds up to a tough environment for starting tech companies. Does this get streamlined as part of the broader immigration reform push? That would certainly be ideal. These are the things that only congress can fix. @hiscock826: What do i tell my constituents when they call to tell my boss to send deport all immigrants? Is there a one shot silver bullet phrase/verbiage i can use? Mass deportation will cost is hundreds of billions of dollars. Legalization is a net plus to the tune of $1.5t in GDP over 10 years. @f.sjl: Doubtful. It is an issue that both sides run on. 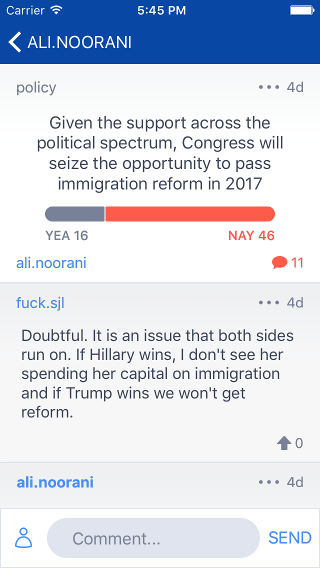 If Hillary wins, I don't see her spending her capital on immigration and if Trump wins we won't get reform. Latino voters will hold Hillary accountable. Ask the Obama folks how much pressure they got from the community. Will be nothing compared to 2017. @f.sjl: What is the communities alternative? Vote for a party openly hostile to their agenda? Groups in the party have to come to terms with what divided government results in. True. But there is GOP support for immigration reform. So there is a center to be found on this unlike most other issues. @f.sjl: Not enough to make a difference currently. We might make inroads if we narrow the gap in the House. But it is a politically charged issue and supporting reform opens up most Republicans to being primaried from the right. House districts are changing. Albeit slower than statewides. But again there is conservative support for reform. Not just from the left. We just need to encourage it. @f.sjl: Do you really think any GOP rep is keen to get in on immigration reform given the mood of the GOP base? Look what Rubio had to do to try to stay competitive. The only one who flipped hard was Rubio and he confused his supporters as a result. Graham, McCain they've all been attacked hard in tough states and not lost.